These are the two opening lines of the poem “Thanks” by American poet Yusef Komunyakaa—but I think they’d make an enticing hook for a mystery story. As a poet, a mystery-fiction editor, and a reader of both genres and forms, I’ve often been struck by the relationship between poetry and mystery fiction, particularly when it comes to a poem’s language and structure. Poetry has an important connection to the American mystery genre—and particularly the short-story side of it, as Edgar Allan Poe is considered by many to have written the first mystery short story. EQMM specifically has a noteworthy history with poetry. Frederic Dannay had a bond with the form, which you can read more about in Janet Hutchings’ post from June 2015. Furthermore, the magazine publishes poetry; many readers will remember the “Detectiverses” and “Criminalimericks” that were at a time found often in EQMM’s pages: short, rhyming verses, usually including a puzzle or a punch-line. And verse by EQMM authors such as William Bankier, John Dobbyn, and Donald Yates has appeared over the years. Last year, in the March/April 2016 issue, we published a handful of Clerihews by Richard Stout, along with a bit of history by him about “the only poetic form created by a writer of detective fiction.” Along similar lines, in 1955 Frederick Dannay included a prose poem by Norman MacLeod titled “Twelve Knives” accompanied by an explanation by the author analyzing and annotating the poem. Poetry was even included in the Department of First Stories in 1969: “Acrostecs” by Laurel Anne McVicker. In his introduction, editor Dannay said, “Yes, it is stretching the form to call these three sonnets a ‘first story’—but as the first-published work of a new writer they are much too good to be passed by because of a technicality of definition . . .” So it seems that the magazine’s goal of providing a diverse collection of writing in each issue spreads across form. The magazine has a history of providing a dynamic reading experience by giving space to the criticism, history, and analysis of poetry as well as the lines of poetry themselves. The characters that inhabit mystery stories inhabit poems, too; in poetry contemporary to classical, we find gamblers, drug dealers, money, violence, jilted lovers, and plenty of weaponry. Thematically, the heart of a poem often resides where the heart of a mystery story does. How do we handle tense situations, relationships gone wrong, frustrated hopes, and genuine or perceived injustice? What do we do with strong emotion, external pressures, and struggles with physical and mental health? Mystery writers are testing the boundaries of the self, digging for the darkness and the truth about what resides inside all of us. Poets are excavating the same thing. Robert Frost’s “Stopping By Woods on a Snowy Evening” is one of my favorites, largely because of the turn in the final stanza and the slowly paced build to it. The first three stanzas are carefully constructed description and consideration, unfolding as measuredly and quietly as the scene described. The tone in the final stanza is a shift, and the repetition of the final line—and the fact that it’s the first instance of repetition in the poem—gives those lines and the “promises” the poet references a deep sense of gravity. The quiet deepens and, somehow, the dark becomes darker. It’s so simple, but chill inducing. Meter specifically is something that most fiction writers aren’t privy to in their prose toolbox (although I’m sure there’s someone out there who can prove that wrong). Some meters, the ones beginning with trochaic feet, are designed to start with a stressed syllable—a punch. Since most traditional English verse is iambic (and begins with an unstressed syllable), it can throw the reader off kilter from the outset, a goal achieved by many mystery writers too. Shakespeare utilized this: In Macbeth, the witches speak in an altered form of trochaic tetrameter, and in A Midsummer Night’s Dream, the fairies. Poe, too, often started lines with trochees. And what can be more jarring than interrupted meter? In “In a Station of the Metro,” a short poem by Ezra Pound, the title and first line establish an imprecise, rhythmic meter that carries onto the third line, just for the final three words to branch from it in three subsequent stresses. To me, it has a nice disruptive effect. for news and forecast. . . .
It’s interesting to think about how a short-story writer would describe a similar scene, and create similar geography, tension, and emotion through entirely different techniques. Once you’re looking for them, the connections don’t stop. Poet Stephen Dobyns has a poem dedicated to Stephen King (see “Lullaby”). “Feeling frightened? / Are you scared?” he asks. Nabokov’s 1962 novel Pale Fire is a mysterious, haunting approach to both poetry and fiction. What are your favorites? I’d love to hear. Many writers are quick to point out there’s “no market” for short stories or for poetry—and many readers are quick to casually stuff mystery writers and poets in their own boxes (artistically, socially, historically, and otherwise). It is hard to ignore the shuttering of small-fiction presses and literary journals, and the proliferation of nonpaying markets for poetry. I’m optimistic enough to think, though, that neither form is in danger—as I’m lucky enough to be connected to both communities, and fond enough of both to seek them out whenever I can. Whether I’m reading poetry or mystery fiction, I’m always searching for the tension between the light of day and whatever element is lurking below the surface. 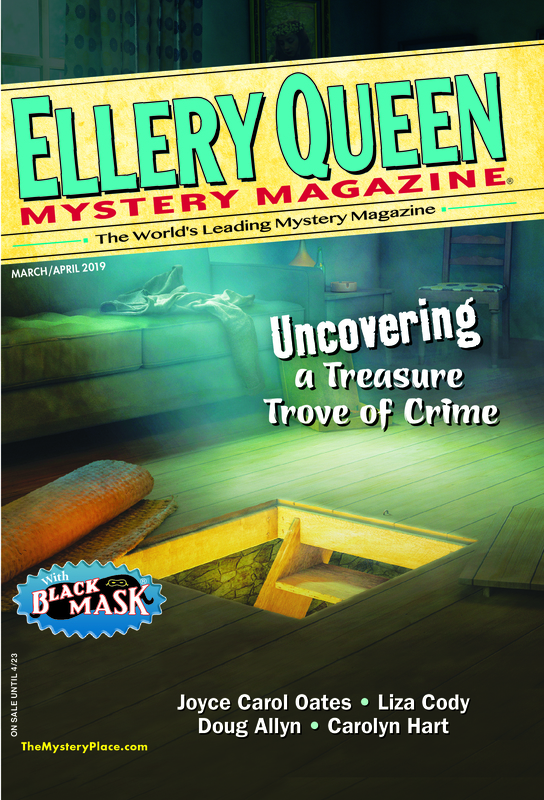 This entry was posted in Editing, Ellery Queen, Genre, Magazine, Noir, Readers, Writers, Writing and tagged form, mystery, poetry, reading, short stories, suspense, writing. Bookmark the permalink. A fascinating piece, thank you for posting it. Interesting you cited Frosts Stopping By Woods. As a young boy growing up in Brooklyn, that was the first poem capable of generating interest in poetry for me, and it remains a favorite. FYI, when Joyce Carol Oates served as editor for the crime anthology New Jersey Noir, she included a poem by Paul Muldoon. That was a first for the Noir series of books. Best of luck with your own work, I look forward to reading you. Love this post! Entertaining and educational in equal measure. I’ll admit I’m more of an occasional than regular reader of poetry, but fascinated by the examples you include here and the points you make about them. Thanks for sharing!